Finding a solution to Moncton's homeless situation was top of mind at a forum held Tuesday night to discuss the issue. Many in attendance wanted to know what was going to happen to those depending on emergency shelters that were opened this winter in Moncton and Fredericton to help get people off the streets. "On April 1st, a lot of people are going to be sleeping out on the street," said panelist Humanity Project founder Charles Burrell. "To see them go back out into the cold just breaks my heart." Volunteers at the Humanity Project have operated a shelter all winter with the help of community donations. A second emergency shelter in Moncton, funded by the municipality and the province, has operated on Assomption Boulevard. The shelters in Moncton and in Fredericton will close on March 31. The federal government has signed an agreement to provide $299.2 million in funding to New Brunswick over the next ten years under its national housing strategy. That money will be available on April 1, but the province won't say how it plans to spend the approximately $30 million it will receive this year, nor when its housing plan will be ready. 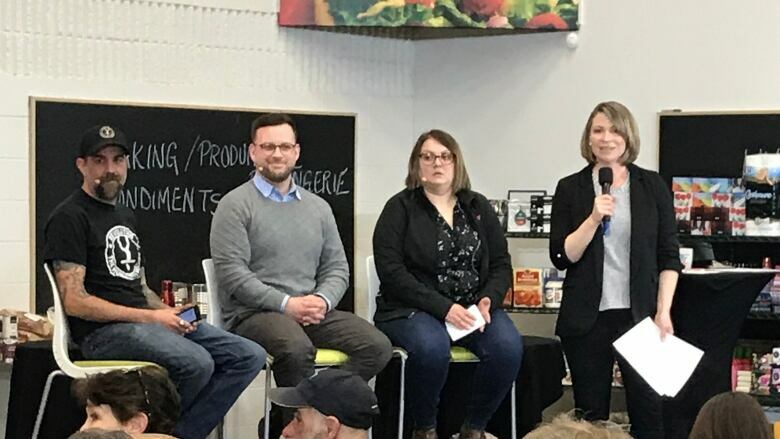 Burrell was joined on the panel by Lisa Ryan, the director of YMCA Moncton ReConnect Street Intervention Program and Vincent Merola, the City of Moncton's community development officer for social inclusion. All said they were anxiously waiting to hear what the province will do. 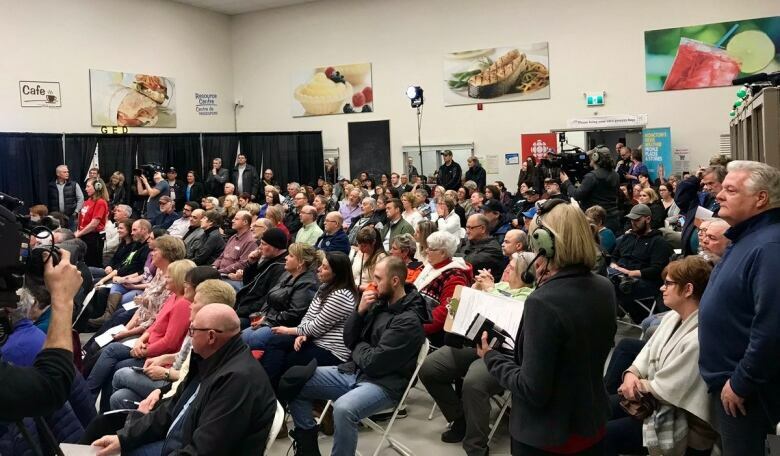 No one attended on behalf of the province but forum moderator, CBC's Vanessa Blanch said the premier, finance minister and social development minister were invited. Burrell and Ryan have both been on the front line dealing with those in need. "It's been a hard winter. Many of us are emotionally drained. We are anxious for April 1," said Ryan. Burrell described it as a sad April Fools' joke that on that date 100 people would be on the street with nowhere to sleep because there is no plan in place. Close to 300 people attended the forum at the Peter McKee Community Food Centre and many asked questions and offered suggestions. Christine Roberts, a single mother who has been homeless, said the biggest challenge for those trying to find affordable housing is dealing with the system itself. "There's nothing out there. It took me three years to get through the system." Roberts said there is a big gap between what the province defines as affordable housing and what the municipality does, something she said has to be addressed. Merola said affordable housing is top of mind in Moncton's housing plan, which will be presented to city council April 1. "At the end of the day we need to realize is that the most important thing our community needs right now is, we need more affordable housing, we need more supportive housing, we need more wrap-around services and we need another shelter." Burrell said in an ideal world, a person would only stay in a homeless shelter for seven to 10 days before getting assessed for their needs, having support services in place and wrap-around services to follow. "It's just working towards those goals with that individual and where they want to be in life and how to move them forward." Ryan said when people identify what they need, they need someone by their side to help with things from dealing with a landlord if there is an issue to learning to get to appointments or use a calendar, little tasks most take for granted. "For some of our folks, that's not the every day." Others at the forum asked if building a village of tiny homes had been considered, how would the money from the province be spent on housing to ensure it was feasible and affordable and what was being done to ensure women, considered by many to be the hidden homeless population, would be provided a safe place. Ryan said it has been identified that there needs to be a women's-only shelter. Burrell agreed. "Most women always have a place to go it just depends on the price they want to pay," he said. All panelists agreed many things needed to change and be improved to help the homeless but some thought things were being moved forward. "I think where we are today is different then where we were last year," said Ryan, but added more peer and community voices are needed in the decision making process. "What we saw this winter really spoke to what community does and what it does well when we work together." For his part and from his experience, Burrell said the government doesn't act, it reacts to issues. He reminded those present how the city's out-of-the-cold shelter was created. "What we need to is keep pushing, push everyday, push faster, push harder and push together. If we push together we can make change." Burell was critical of a lack of consultation by provincial authorities, pointing out no one had visited the shelter his agency ran to ask those there what they needed. "To me you can't come up with a plan to help the homeless without working with the homeless. So if they haven't been working with the homeless, how do they expect this to work?"